Adium is a fantastic IM client for Mac, but unfortunately its been lacking updates in the recent times. When it comes to Facebook Chat, Adium used to work flawlessly with it, however over the past month or so it started to play up. First, I could not use the standard Facebook account support, it would ask me to authenticate over and over. I got around that by switching to the chat.facebook.com Jabber account, this allowed me to keep using my Facebook account with Adium for a time, but last weekend that finally stopped working too. This is happening in version 1.5.11b2 of Adium. Although it looks like Facebook chat support for Adium is gone, there is a way forward. Messages doesn't work with Facebook any longer. See this article for further details and alternative apps. Lets see what's happening with Adium first however. 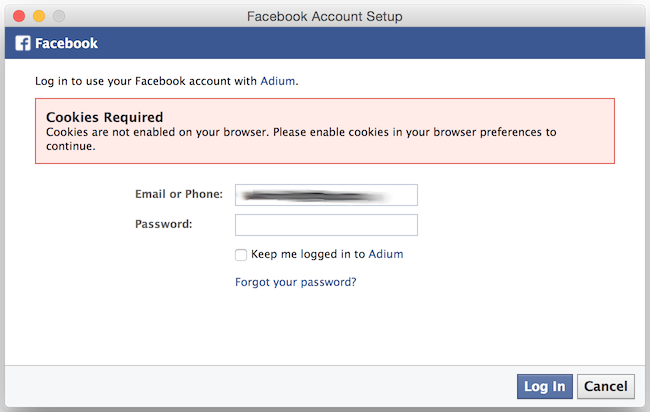 When I login using the standard Facebook account in Adium, I am presented with this login window over and over. When using the Jabber account for chat.facebook.com, Adium appears to authenticate OK, but then gets stuck 'Connecting'. 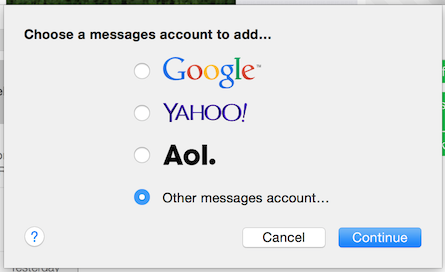 Since Adium is out for this, I've switched to the OS X Messages app. 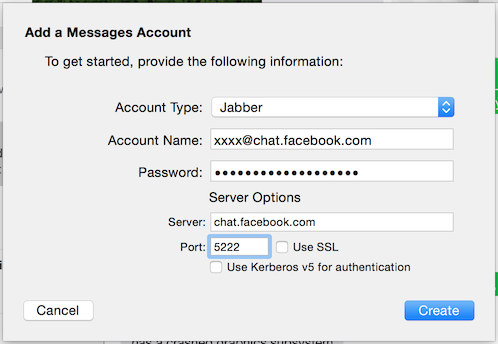 Somehow it still works with the chat.facebook.com Jabber server. Setting it up is easy too. Although Messages doesn't look anywhere near as nice as Adium, it is a workable solution. Messages also works with Google chat and I was able to use my work Jabber server with it too, so I've completely switched over to Messages for all my IM needs now. The only downside is it doesn't support OTR, but that's not a big deal. OK, so to add your Facebook account to Messages, click the Messages → Add Account... menu, then select Other messages account... and click Continue. That's all there is to it, Messages will then connect to your Facebook Chat and you can use that to communicate with your friends as you did with Adium.